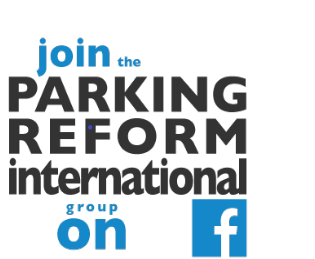 Did you know that the Canadian prairie city of Calgary has adopted the "Shoupista" policy of demand-responsive on-street parking pricing? Was there much controversy about this? If so, I missed it. There has been one initial price adjustment so far in which some prices went down $0.25, some up $0.25 while some remained the same, depending on the demand in each time period for each area. See this set of maps (pdf) for details. 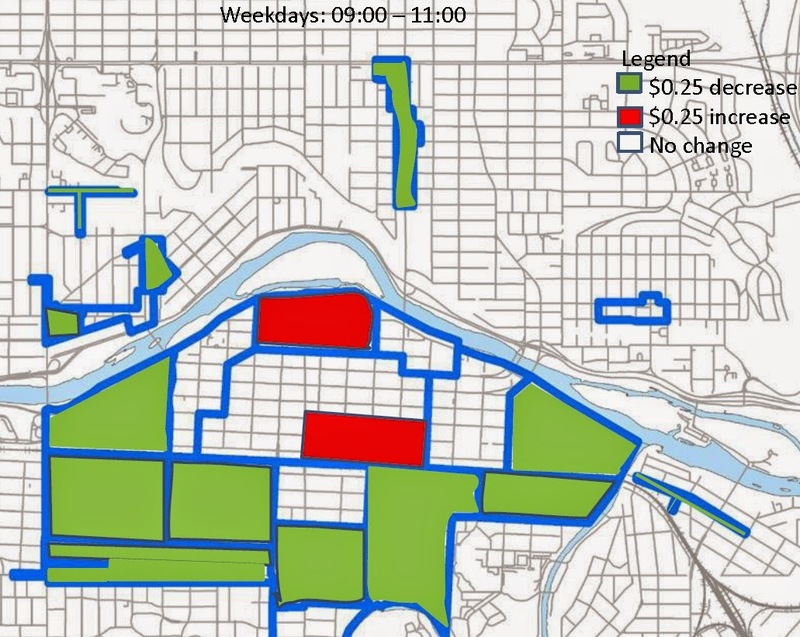 Prices vary among modest-sized zones, not from block to block, as in SFPark. To give an idea of scale, the large island at the bend in the river is about 1 km from east to west. So the price zones here are often about 500 metres or less across. The time periods that can have different prices for the same location are: Weekdays: 09:00 – 11:00, Weekdays: 11:00 – 13:30; Weekdays: 13:30– 15:30; Weekdays 15:30 – 18:00; and Saturdays 9:00 – 18:00. See also their interactive map showing occupancies and (with a click) the prices for each location. Do readers have additional insights on how this is going so far? Did all of these locations already have priced parking before this initiative? 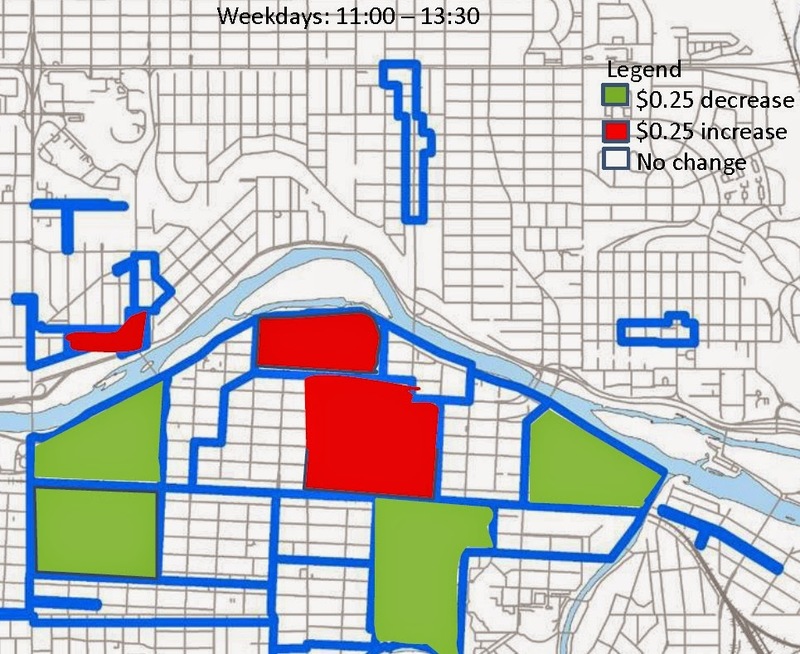 "All these areas have been metered for quite some time now. Downtown Calgary has the highest (off-street) parking rates in Canada and the second highest in North America (after NYC), they have had parking maximums in downtown for a long time. They modernized their parking system about 6 years ago, replacing meters with block-by-block pay stations (and SMS-based payment option) and car-mounted licence plate readers for enforcement. I lived in Calgary at the time and I don't recall much public outcry over this. Later they also added early checkout options to get a refund when you leave early, overall a really nice system. In the beginning I remember some issues with people backing into 90 degree stalls (some public parkades use the same system) and incurring tickets because of that (Alberta only has license plates on the back, so backing in prevents enforcement by license plate readers). Have not heard anything about the rate changes, but there is a lot of controversy about removing parking in favour of bike lanes downtown. And with hourly rates over $4 in the red areas of the above map, I doubt people will even notice the additional $.25."